Sometimes we all need a break from the spinning reels of our favourite online slot machines and fortunately there are plenty of options when it comes to similar diversions at our online casinos. Texas Hold’em has for some time been the most dominant poker variant on the planet; it’s played online and offline with an equal passion and there are also a range of games available for those who would just like to play against the dealer. 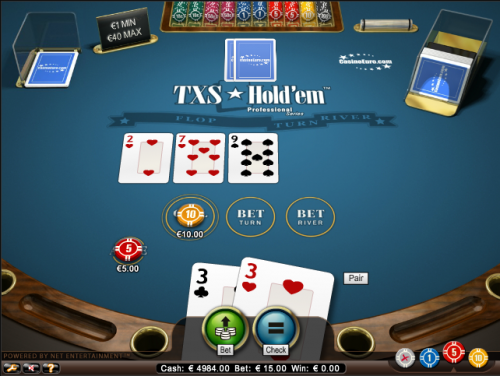 Net Entertainment‘s TXS Hold’em is one such game and essentially you will be playing ‘heads-up’ hands against the house; this means it’s just you against a computer opponent without the usual distractions of a multiplayer game. When you start playing you’ll be presented with a poker table with four circles marked in front of you labelled Ante, Flop, Turn & River. Before the deal you must place a bet on the Ante and the level of this bet will form the basis for any subsequent bets – the minimum is €1.00. Once you’ve decided on your Ante amount you can press the ‘Deal’ button and you’ll receive you two cards; you can now decide whether to continue playing or fold you hand. To continue you just press ‘Call’ and chips double the value of your Ante will be moved onto the Flop circle. The Flop will now be dealt (three community cards in the centre) and now you can decide whether to Bet again or Check (continue without betting). If you bet now it is worth the same as your Ante and then the Turn is dealt (one more community card). Now there’s one last chance to Bet or Check and one last card dealt (the River). Both hands will now be revealed with the winner declared depending on who has the best five card poker hand. You can now start again! This is a slightly simpler version of Texas Hold’em than you’d normally play; for example the player or the opponent cannot raise at any point and cannot bet again after the River has been dealt. It’s also a bit like Blackjack in that the Computer will never fold it’s hand so it’s just up to you to decide if yours is better. These slightly restrictive features make this a poker game for those who are perhaps unused to standard Hold’em rules; if you want a proper game of poker there are certainly better options available but this is simple and fun.